It is said that a hundred civilizations are buried beneath the sands of Elsweyr, and it may be unwise to assume our current Empire will forever stand above the shifting sands of the desert province. The Khajiit who occupy the southern land between Black Marsh and Valenwood have always been a restless people, and prove regularly that nothing in Tamriel is immortal. Khajiit are commonly considered one of the beast folk, one of the few survivors of the original inhabitants of Tamriel before the coming of mer and man, and Elsweyr is their home. This tradition is not, of course, accepted by one and all. Alternate theories abound about their origin, based mainly around the fact that one of the breeds of Khajiit, the Ohmes-Raht, so closely resembles the elven folk that they could be cousins. Some believe that the Khajiit are simply descendants of the original Aldmer settlers in Tamriel, who evolved, like the Altmer, Bosmer, Dunmer, and Orsimer, because of circumstance, into the cat-like race that walks the dunes of Elsweyr. If so, they are just one more of the alien, sentient species who have made themselves so much a part of Tamriel to be confused for natives. The more commonly held belief, however, is that they were not foreign intelligent creatures who became cats to survive the hostile, arid land of Elsweyr, but they were indigenous cats whose knack for change allowed them to survive while other native creatures declined and disappeared. It is strange to think that so inhospitable a land, of blistering heat and crop destroying wind, would have been the fecund womb for one of the original predators of Tamriel, but that seems to be the unlikely likelihood. Topal the Pilot in his peregrinations around Tamriel encountered the Khajiit not in Elsweyr, but far up the Niben River, close to the Imperial City, where they preyed on other native creatures, and caused his crew much distress as they stalked the river banks. We have records too from the Merethic Bosmer that certain parts of Valenwood were to be avoided for fear of the great jungle cat men. It may be comfortably surmised that the Khajiit, though most at home in the deserts, reigned as the dominant culture across southern Tamriel in ancient days. The Khajiit kingdoms were simply a fact when historians began to put quill to paper and record life for posterity. When the early human settlers in Tamriel were only just beginning to understand what plants grew where under what circumstance, there were already mercantile caravans in modern day Rimmen; when the transplanted natives of Atmora and Aldmeris were vying for dominance in the north, the Khajiit had already developed a sophisticated culture in the south. In the early First Era, there were sixteen independent realms in Elsweyr. Unlike typical human and elvish kingdoms, these regions did not compete with one another for land and power. Earlier versions of this Guide spoke of tribal conflict, but the truth was quite the opposite in the earliest Khajiit society. Recognizing their own idiosyncratic characters and strengths, each territory specialized in one specific duty, supplying its neighbors with its bounty in exchange for equal measure. Ne Quin-al, where great warriors were born and trained — its Temple of Two-Moons Dance is famous even in our day — might trade its warriors to Torval in exchange for fish and other bounties of the sea. The dominance of each region was checked by the moons. It was said that when both moons were full, Ne Quin-al was in dominance; when both moons were half, Torval; when both moons were new, Senchal. The other regions too had their days of power and influence. For a thousand years this delicate astronomic and political dance was equal to facing every threat posed against the Khajiit. The Alessian Empire chose not to extend its borders too far south, and the Bosmer of Valenwood likewise knew how far eastward they dared to extend their kingdom. But the terrible Thrassian Plague of 1E 2260 finally upset this balance forever. Travelling down the trade routes into the heart of Elsweyr, the plague decimated the Khajiit, forcing the survivors into roles they did not choose. Thus was the province turned from sixteen states to only two: Pa'alatiin and Ne Quin-al, more commonly known by their Cyrodilic names of Pellitine and Anequina. The two kingdoms, of course, represented the moons at their extremes, but also radically different interpretations of Khajiit culture, which they adopted from the tribes each had absorbed. The people of Pellitine considered their neighbors in Anequina to be uncouth barbarians, while the Anequinians looked to the south, and saw only decadence and depravity. For many more centuries, the two lands fought, neither gaining appreciable ground. The South had the wealth and could hire mercenaries and withstand sieges, but the North had a warrior culture, and could never be dominated. When the two united in 309th year of the 2nd Era with the marriage of Keirgo of Anequina and Eshita of Pellitine, the two rulers fully recognized how historic their pact was, and renamed their land accordingly, to Elsweyr. The derivation of this unusual name has perplexed scholars. One commonly held rationale hinges on a particular Khajiit proverb that "a perfect society is always found elsewhere," suggesting that the new King and Queen had that aim, and that sense of humor. Another is that it is a reference to Llesw'er, a paradise promised to the Khajiit by the Riddle'Thar. Either possibility points to an optimism which was not to be matched by reality. The following centuries into and including the Third Era have been times of intermittent strife among the Khajiit of Elsweyr. Successive spiritual leaders, known as Manes, occasionally brought tenuous peace to the land, but never for long. The Khajiit have found security in being absorbed into the Cyrodilic and then the Septim Empires, only to rebel against both. They have sought solace in their rich literary tradition, finding the tales of Rajhin the Thief to speak to their people, but they have stopped the flow of books into their land, for fear of Imperial propaganda. They have tried to enrich their pockets with drug-trafficking, only to enslave their minds to moonsugar. They have engaged in wars with Valenwood on grounds that have constantly shifted, like the sands of Elsweyr itself. It may be fair to say that Elsweyr is in crisis. And it may further be accurate to say that such chaos is home. The Five Year War with Valenwood shifted the borders of Elsweyr slightly west, taking both banks of the Xylo River. At the end of the Imperial Simulacrum, a diplomatic attempt was made to return the land to Valenwood, but the Khajiit settlers who had already claimed the land refused to move. The Empire eventually found that it was best to leave the situation as it was, possibly persuaded by legal proof that the land rightly belonged to the Khajiit by ancient treaty, and to keep a dangerous situation from getting worse. 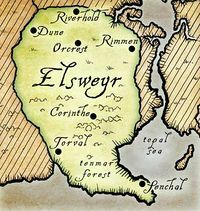 Elsweyr's overall territory, however, has not increased, due to a border arrangement which was not in that nation's favor. In the east, the long disputed border with the Cyrodilic County Leyawiin was recently resolved in Cyrodiil's favor, after an agreement between the current Mane and the Count of Leyawiin. But a group of Khajiit bandits known as the Renrijra Krin has taken up the cause of returning the land to Elsweyr, and the West Niben remains a trouble spot. The harbor city of Senchal, long considered one of the most dangerous slums in Tamriel, has had a remarkable renaissance, from principle port of the drug trade, to coastal resort for wealthy, powerful Khajiit. That glimmer of good news belies the fact that the moonsugar trade in Elsweyr has increased multifold in the last twenty years. Ya'Tirrje, the Gold Cat, is rumored to even have a luxurious villa in Senchal, and helps pay for the abundant security that keeps the city safe and crime-free, all the while continuing his drug-smuggling business in Torval, Corinthe, and Rimmen. This page was last modified on 1 January 2019, at 12:50.